This article is about the Biblical matriarch. For the given name, see Rebecca (given name). For other uses, see Rebecca (disambiguation). Rebecca[a] appears in the Hebrew Bible as the wife of Isaac and the mother of Jacob and Esau. According to biblical tradition, Rebecca was the daughter of Bethuel the Aramean from Paddan Aram, also called Aram-Naharaim, and sister of Laban the Aramean. She was the grand daughter of Milcah (Sarah's sister according to Talmudic teachings) and Nahor (brother of Abraham). Rebecca and Isaac were one of the four couples that some believe are buried in the Cave of the Patriarchs, the other three being Adam and Eve, Abraham and Sarah, and Jacob and Leah. After the Binding of Isaac, Sarah died. After taking care of her burial, Abraham went about finding a wife for his son Isaac, who was already 37 years old. He commanded his servant (whom the Torah commentators identify as Eliezer of Damascus) to journey to his birthplace of Aram Naharaim to select a bride from his own family, rather than engage Isaac to a local Canaanite girl. Abraham sent along expensive jewelry, clothing and dainties as gifts to the bride and her family. If the girl had refused to follow him, Abraham stated that Eliezer would be absolved of his responsibility. To his surprise, a young girl immediately came out and offered to draw water for him to drink, as well as water to fill the troughs for all his camels. Rebecca continued to draw water until all the camels were sated, proving her kind and generous nature and her suitability for entering Abraham's household. The servant immediately gave her a golden nose ring and two golden bracelets (Genesis 24:22), which Rebecca hurried to show her mother. Seeing the jewelry, her brother Laban ran out to greet the guest and bring him inside. The servant recounted the oath he made to Abraham and all the details of his trip to and meeting with Rebecca in fine detail, after which Laban and Bethuel agreed that she could return with him. After hosting the party overnight, however, the family tried to keep Rebecca with them longer. The servant insisted that they ask the girl herself, and she agreed to go immediately. Her family sent her off with her nurse, Deborah (according to Rashi), and blessed her, "Our sister, may you come to be thousands of myriads, and may your offspring inherit the gate of its foes." 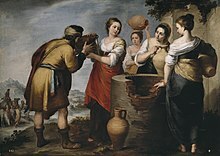 As Rebecca and her entourage approached Abraham's home, they spied Isaac from a distance in the fields of Beer-lahai-roi. The Talmud and the Midrash explain that Isaac was praying, as he instituted Mincha, the afternoon prayer. Seeing such a spiritually exalted man, Rebecca immediately dismounted from her camel and asked the accompanying servant who he was. When she heard that this was her future husband, she modestly covered herself with a veil. Isaac brought her into the tent of his mother Sarah, married her, and loved her. According to Rashi, the three miracles that characterized Sarah's tent while she was alive, and that disappeared with her death, reappeared when Rebecca entered the tent. These were: A lamp burned in her tent from Shabbat eve to Shabbat eve, there was a blessing in her dough, and a cloud hovered over her tent (symbolizing the Divine Presence). Some of the events leading up to the marriage of Isaac and Rebecca have been institutionalized in the traditional Jewish wedding ceremony. Before the bride and bridegroom stand under the chuppah, they participate in a special ceremony called badeken (veiling). The bridegroom is led to the bride by two escorts and, seeing her, covers her face with a veil, similar to the way Rebecca covered her face before marrying Isaac. Then the bridegroom (or the father of the bride, or the officiating rabbi) recites the same blessing over the bride that Rebecca's family recited over her, "Our sister, may you come to be thousands of myriads, and may your offspring inherit the gate of its foes." According to the traditional counting cited by Rashi, Isaac was 37 years old at the time of the Binding of Isaac; Sarah, who gave birth to Isaac when she was 90, died after the binding when she was 127 years old, making Isaac around 37 at that time. Isaac was 40 years old when he married Rebecca, 20 years elapsed before they had children. Throughout that time, both Isaac and Rebecca prayed fervently to God for offspring. God eventually answered Isaac's prayers and Rebecca conceived. Rebecca was extremely uncomfortable during her pregnancy and went to inquire of God why she was suffering so. According to the Midrash, whenever she would pass a house of Torah study, Jacob would struggle to come out; whenever she would pass a house of idolatry, Esau would agitate to come out. Thinking that she was carrying one baby who was displaying conflicting propensities, Rebecca sought enlightenment at the yeshiva of Shem and Eber. There she received the prophecy that twins were fighting in her womb and would continue to fight all their lives. The prophecy also said that the older would serve the younger; its statement, "One people will be stronger than the other" has been taken to mean that the two nations will never gain power simultaneously; when one falls, the other will rise, and vice versa. According to tradition, Rebecca did not share the prophecy with her husband. When the time came for Rebecca to give birth, the first child to come out emerged red and hairy all over, with his heel grasped by the hand of the second to come out. Onlookers named the first עשו, Esau ('Esav or 'Esaw, meaning either "rough", "sensibly felt", "handled", from Hebrew: עשה‎, asah, "do" or "make"; or "completely developed", from Hebrew: עשוי‎, assui, since Esau had as much hair as a child who was much older) The second was named יעקב, Jacob (Ya'aqob or Ya'aqov, meaning "heel-catcher", "supplanter", "leg-puller", "he who follows upon the heels of one", from Hebrew: עקב‎, aqab or aqav, "seize by the heel", "circumvent", "restrain", a wordplay upon Hebrew: עקבה‎, iqqebah or iqqbah, "heel"). The Bible states that Isaac was sixty years old when the twins were born. The Midrash says that as long as they were young, people did not notice much difference between the boys. But when they reached the age of 13, Jacob busied himself in the house of study, while Esau busied himself with idolatry. The descriptions of the two young men hint at their opposing spiritual natures: "The lads grew up and Esau became one who knows hunting, a man of the field; but Jacob was a wholesome man, abiding in tents". The description of Esau as a "hunter" hints to his skill of trapping his father with his mouth; for example, he would ask Isaac whether tithes should be taken from salt and straw, making his father think he was scrupulous in keeping the mitzvahs. Scripture notes that the attitudes of their parents toward the boys differed: "Isaac loved Esau because he did eat of hunting, but Rebecca loved Jacob". According to the Talmud, immediately after Abraham died, Jacob prepared a lentil stew as a traditional mourner's meal for his father, Isaac. The Hebrew Bible states that Esau, returning famished from the fields, begged Jacob to give him some of the stew. (Esau referred to the dish as "that red, red stuff", giving rise to his nickname, Hebrew: אדום‎ ('Edom, meaning "Red").) Jacob offered to give Esau a bowl of stew in exchange for his birthright (the right to be recognized as firstborn), and Esau agreed. The Talmudic dating indicates both men were 15 years old at the time. At a later time, a famine struck the land of Israel and Isaac moved his family, upon God's command, to Gerar, which was ruled by Abimelech, king of the Philistines. Like Abraham before him, who called Sarah his "sister" rather than his "wife" so that the Egyptians would not kill him and take his wife, Isaac told the people of Gerar that Rebecca was his sister. She was not molested, but one day Abimelech looked through the window and saw Isaac "sporting" (a euphemism for sexual play) with her. Abimelech called Isaac on his lie, and then warned others not to touch Rebecca. Eventually Isaac parted from Abimelech in peace. At the age of 40 (the same age his father had been when he married), Esau took two Hittite wives, Judith the daughter of Beeri, and Basemath the daughter of Elon, who vexed Isaac and Rebecca to no end, as these women were also idol-worshippers. One reason why Isaac became blind in his old age was due to the smoke of the incense that these women offered to their idols. Isaac became blind in his old age and decided to bestow the blessing of the firstborn upon Esau. According to the Midrash, Isaac had reached the age of 132, five years past the age his mother, Sarah, had been at her death. According to Genesis, Isaac had reached the age of 137. At this time, the Sages state that one should begin to think he might not exceed the age of whichever parent died first. Isaac therefore sent Esau out to the fields to trap and cook a piece of game for him, so that he could eat it and bless Esau before he died. Rebecca overheard this conversation and realized that Isaac's blessings should go to Jacob, since she was told before the twins' birth that the older son would serve the younger. She therefore ordered Jacob to bring her two goats from the flock, which she cooked in the way Isaac loved, and had him bring them to his father in place of Esau. Thus disguised, Jacob entered his father's room. Surprised to perceive that Esau was back so soon, Isaac asked how it could be that the hunt went so quickly. Jacob responded, "Because the LORD your God arranged it for me"; Rashi (on Genesis 52:46) says Isaac's suspicions were aroused because Esau never used the personal name of God. Isaac demanded that Jacob come close so he could feel him, but the goatskins felt just like Esau's hairy skin. Confused, Isaac exclaimed, "The voice is the voice of Jacob, but the hands are the hands of Esau!" (27:22). Still trying to get at the truth, Isaac asked him point-blank, "Are you really my son Esau?" and Jacob answered simply, "I am" (which can be taken as "I am me", not "I am Esau"). Isaac proceeded to eat the food and to drink the wine that Jacob gave him, and then he blessed him with the dew of the heavens, the fatness of the earth, and rulership over many nations as well as his own brother. Jacob had scarcely left the room when Esau returned from the hunt to receive the blessing. The realization that he has been deceived shocks Isaac, yet he acknowledged that Jacob received the blessings as sworn, by adding, "Indeed, he will be [or remain] blessed!" (52:8). Rashi explains that Isaac smelled the heavenly scent of Gan Eden (Paradise) when Jacob entered his room. As a contrast, Isaac perceived Gehenna opening beneath Esau when the latter entered the room. Showing Isaac that he had been deceived all along by Esau's show of piety. Esau was heartbroken by the deception, and begged for his own blessing. Having made Jacob a ruler over his brothers, Isaac could only promise, "By thy sword thou shalt live, and shalt serve thy brother; yet it shall come to pass when thou shalt have the dominion, that thou shalt cast off his yoke from off thy neck" (Gen 27:40). Esau was filled with hatred toward Jacob for taking away both his birthright and his blessing. He vowed to himself to kill Jacob as soon as Isaac died. Here again, Rebecca prophetically perceived his murderous intentions and ordered Jacob to travel to her brother Laban's house in Haran, until Esau's anger subsided. She then convinced Isaac to send Jacob away, by telling him that she despaired of him marrying a local girl from the idol-worshipping families of Canaan (as Esau had done). After Isaac sent Jacob away (to find a wife), Esau realized that his own Canaanite wives were evil in his father's eyes. Esau therefore took Mahalath, a daughter of Isaac's half-brother Ishmael, as another wife. She needed to be buried secretly. Had she had the type of burial she deserved, Esau would probably have attended, and there was risk of Rebecca being treated disrespectfully as the one who gave birth to such a wicked son. She was buried in tragic circumstances: Isaac was blind and could not come to honor her properly; Jacob was away; and Esau refused to come because he still hated her for taking away his blessings. According to the Talmud, the Torah's explicit dating of the life of Ishmael helps to date various events in Jacob's life and, by implication, the age of Rebecca at her death. Ishmael was born when Abraham was 86 years old (Gen. 16:16) and died at the age of 137 (Gen. 25:17). Isaac was born when Abraham was 100 (Gen. 21:5); at that time Ishmael was 14. Jacob and Esau were born when Isaac was 60 (Gen. 25:26); at that time Ishmael was 74. Right after Jacob receives the blessings and flees to Laban, the Torah states that Esau married "Mahalat, the daughter of Ishmael, son of Abraham, sister of Nebaiot" (Gen. 28:9), on which Rashi, quoting Megillah 17a, notes that Ishmael died between the engagement and wedding, so the girl's brother gave her away. If Ishmael was 137 at the time of his death, this means that Jacob and Esau were 63 at the time of the blessings. The Talmud adds that Jacob spent 14 years in the yeshiva of Shem and Eber before proceeding to Laban, arriving when he was 77. Rebecca's death after Jacob's 20 years with Laban indicates that Jacob was 97 when his mother died and Rebecca was either 120 or 134 (based on different Midrashim mentioned earlier about her age at marriage). ^ "Rebecca". Online Etymology Dictionary. 2010. Retrieved 29 May 2011. ^ "Meaning and etymology of the name Rebecca (Rebekah)". Abarim Publications. Retrieved 29 May 2011. ^ Hamori, Esther J. (2015). Women's Divination in Biblical Literature: Prophecy, Necromancy, and Other Arts of Knowledge. Yale University Press. ISBN 978-0-300-17891-3. ^ Tuchman, Shera Aranoff; Rapoport, Sandra E. (2004). The Passions of the Matriarchs. KTAV Publishing House, Inc. ISBN 978-0-88125-847-9. ^ "Cave of the Patriarchs". Chabad.org. Retrieved 4 February 2014. ^ Scherman, Rabbi Nosson (1993). The Chumash. Brooklyn, New York: Mesorah Publications, pp. 109–21. ^ "Jewish Wedding Ceremony Explained". nyc.rr.com. Archived from the original on 12 February 2004. ^ "Jacob and Esau". Chabad.org. Retrieved 4 February 2014. ^ Rosenzweig, Rabbi Yosil (29 November 1997). "Vortify Yourself: Parshat Toldot". United Jewish Community of the Virginia Peninsula. Archived from the original on 18 May 2011. Retrieved 30 December 2010. ^ Rashi on Genesis 25:23. ^ Rashi on Genesis 50:50. ^ This is understood from the plain meaning of the verses. Abraham was one hundred years when Isaac was born (Genesis 46:5). Isaac was sixty years old when the twins were born (Genesis 25:26). Abraham died at the age of 175 (Genesis 25:7), making Jacob and Esau fifteen years old at the time of Abraham's death. ^ Rashi on Genesis 52:1, citing Tanhuma 8. ^ a b Scherman, Rabbi Nosson (1993). The Chumash. Brooklyn, New York: Mesorah Publications, p. 135. ^ Rashi, quoting Midrash Tanchuma, Ki Teitzei 4. 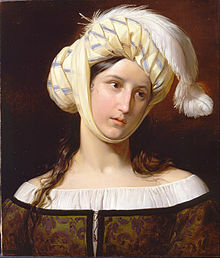 Wikimedia Commons has media related to Rebecca. Nicholas Poussin's "Rebecca at the Well"